At the time of this writing, we are busy getting ready for the Big E (Eastern States Exposition). The CWA’s from each of the New England states spearhead the collection of handmade items to be sold in our lovely little Country Store in the New England Grange Building. Connecticut has once again contributed an unbelievable number of beautiful things!! We thank you most sincerely for the wonderful response! New England and New York State hold the judging for the needlework contest at the Big E and we will be hoping for some winners for our state. All of our first place state winners will be on display- and will also be on display at our State Session. Good luck to all! 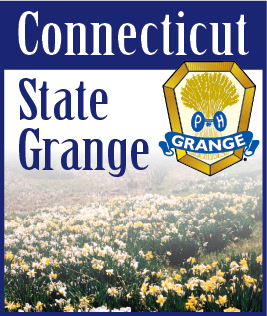 Hope you will (or have) visited the Grange Building and the store. It’s a great place to start your Christmas shopping. How time flies!!! We can’t believe it is eight years since Brother Prelli appointed us as your state committee - and four years later Brother Sendewicz requested that we be in his group. There are no words to express what a joy and pleasure it has been for Joan, Jane, Ruth, Anne and me to plan and carry out the contests and projects of the department. It has been a job close to our hearts and always will be. We can’t even attempt to account for all the good things you all have made possible. Just think of the hours of work you have given, the amount of funds you have raised, the older people you have made happier and the children who have received lovely things they might never have had without your generosity. You have supported all the contests and projects, offered the opportunity for people to earn awards and recognition for their handiwork and other skills, and have presented Grange friendship and fellowship. It has been overwhelming to us. To the new Director and committee we wish the best of everything. You are in for a truly wonderful experience and we hope you will enjoy it as much as we have and meet with great success.